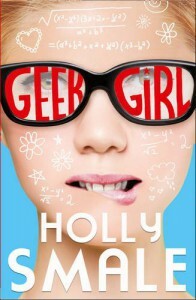 Geek Girl was a surprisingly quick and entertaining read. Our heroine Harriet was both lovable and sweet and so geeky and adorable. Harriet has always lived in the periphery - she often feels like a "polar bear in the rain forest," which may or may not be a good thing. Harriet often finds herself in all sorts of wacky situations and her primary coping mechanism is to dive under a table and hide. While on a field trip to Birmingham, Harriet is discovered by a large modeling agency and made the fresh new face of Baylee. A gawky girl in high heels, stumbling, much like she stumbles through life. But there is an endearing grace to Harriet that makes you fall in love with her. I liked that Harriet was not one of those cookie cutter drop dead gorgeous girls. Harriet struggles and stumbles through life - her arch-nemesis Alexa bullies and humiliates her to no end, her beautiful best friend Nat dreams of becoming a model, and she is "stalked" by Toby, who adores her. Harriet is brilliant, but her social skills are a little lacking. I think that what I loved about this book was the actual inclusion of parental figures - Harriet's father and stepmother offered Harriet some stability and love. Geek Girl was an enjoyable read, full of hilarious moments. I'm looking forward to reading more books by this author in the future.